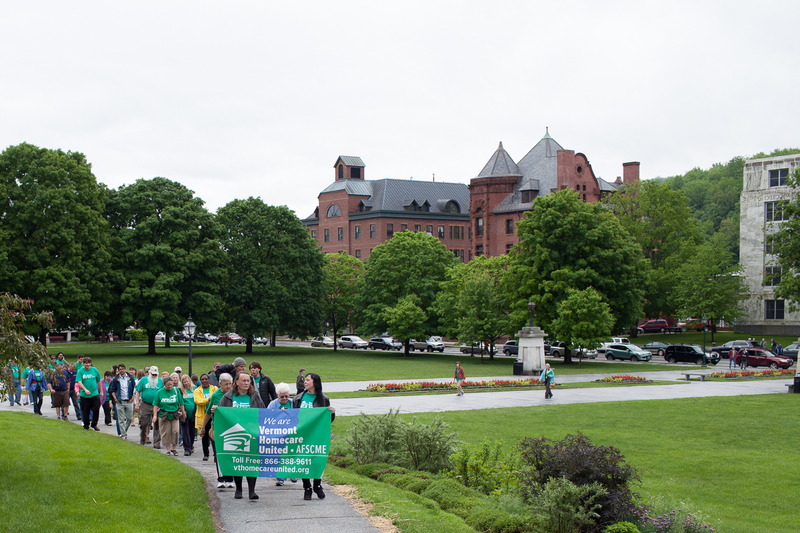 Homecare providers with AFSCME’s Vermont Homecare United march past the state capitol on the way to filing for their historic union election. The mood was hopeful and energetic in Montpelier today as homecare providers with AFSCME’s Vermont Homecare United filed a petition for their union election. The petition will start the process for Vermont’s largest-ever union election, giving about 7,000 homecare providers the chance to vote for Vermont’s union. 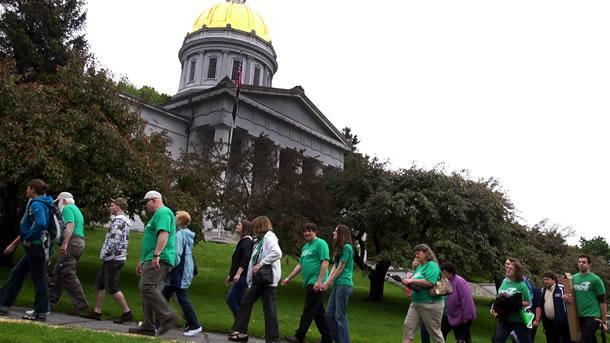 A petition filed Wednesday by approximately 7,500 Vermont homecare providers seeks the state’s permission to vote to form a union with Vermont Homecare United/AFSCME. Legislation approving their right to organize a union was given final approval in May. Once a majority vote to form their union, they will have a formal seat at the decision-making table to improve their training, benefits and compensation. AFSCME Sec.-Treas. Laura Reyes was in Vermont for a press conference announcing the petition. She writes about it in The Huffington Post, reprinted here. I am in Vermont today as thousands of home care providers in the Green Mountain State file for the largest union election in the state’s history. I know first-hand the struggle home care providers face. I also know the power and possibilities that are created when providers come together and form a union that cares about home care workers and the people we serve. I know it because I am a home care provider and have walked in the shoes of Vermont providers. My oldest son was born two and a half months early. He had a brain hemorrhage, and the doctors diagnosed him with cerebral palsy. They said he would never speak or walk. That’s when I quit my job as an educator and became a home care provider. I knew that with constant care and attention, Damien would overcome the obstacles. And he did. Today he is not only walking and talking, he’s in college preparing for a full life of opportunity. So I know what it is like to decide that you can achieve more for your family and loved ones together than you can alone. I decided to get active with AFSCME nearly two decades ago. Now thousands of Vermont’s home care providers have taken that same step. AFSCME has a proud history here in Vermont. For six decades, thousands of workers across the state have been working for the best interest of working families and the communities we serve. From workers at non-profit agencies like the Howard Center in Burlington – to the public school bus aides for children with special needs in Rutland – to the Bennington Police – the Green Machine of AFSCME members has been critical to moving the Green Mountain State forward. We’ve made progress across the country. Home care workers in Maryland joined AFSCME and won their first pay raise in 18 years. Home care workers in Iowa joined and won their first pay raise in the history of the program. Iowa created a new referral registry to connect providers and clients. And in my home state of California, we’ve won health benefits, annual cost of living raises, worker’s compensation coverage and more paid hours for the care we provide. None of these victories were guaranteed or are permanent. Home care programs often get caught in the crosshairs of political posturing. That’s why it is so important for providers to chose the union that has a long term commitment to the struggle. In many ways, my story represents AFSCME’s commitment to home care. As a single mom taking care of my son, like many providers, I felt isolated and powerless. I learned, through AFSCME, that there were 60,000 providers in my local union. I learned that there were hundreds of thousands in other states, in similar circumstances. When I learned that, I found my voice. I was empowered by our organizing. That’s what it’s about. That’s why home care providers like Carol Delage in St. Albans, Leona Ingalls in Johnson, Patrick Willis in Montpelier, Mary Montgomery of Washington, and Heather Boyd in Shelbourne are joining together in Vermont. 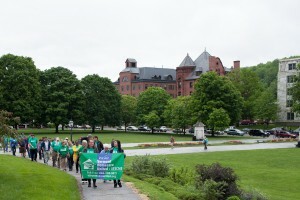 They and thousands of other home care providers are joining together with AFSCME Vermont Homecare United. Together, we are working to change our culture and policies to provide real dignity and respect – dignity and respect for those who receive home care services and those who provide them. For seniors and people with disabilities, their quality of life and safety depends on the reliability and the skill of their home care provider. Their access to services that keeps them independent depends on a stable and committed workforce. Yet, low wages, long hours and no benefits will continue to drive more workers out of these important jobs. The tragic result will be more seniors and Vermonters with disabilities denied the services they need. These are our neighbors. In taking care of them, home care providers are taking of care of our communities. They are giving others a chance to lead their lives with independence and the dignity and respect they deserve. But respect is also a job with a living wage. Respect is paid time off so that providers can take a sick day when they are sick or need to take their child to the doctor. Respect is proper training so that they can give the highest quality care possible to the people providers serve. I was honored to be in Vermont today and to stand with all the members of AFSCME Vermont Homecare United. Together, we will work to improve conditions for home care providers and enhance the lives of all the people we serve.